It's troubling enough to see America failing to be the world leader we once were. It's been more troubling to see the consistent attack on biblical Christians at the US Air Force Academy and other military facilities over the past several years. Most Americans believe those who fight to preserve our freedom should be given the freedom to live out their Christian faith. However, this new revelation is profoundly troubling---donations, or tithes, from the chapel services are being used to sponsor participation in witchcraft, Wiccan, voodoo, New Age, Mother Earth and other similar religious festivals and events. In 2013, the Air Force Academy made "so help me God" optional to the cadet's oath. TIME Magazine reported the decision, making considerable effort to "explain" that the "In God We Trust" ---or the "so help me God" idea was relatively new. 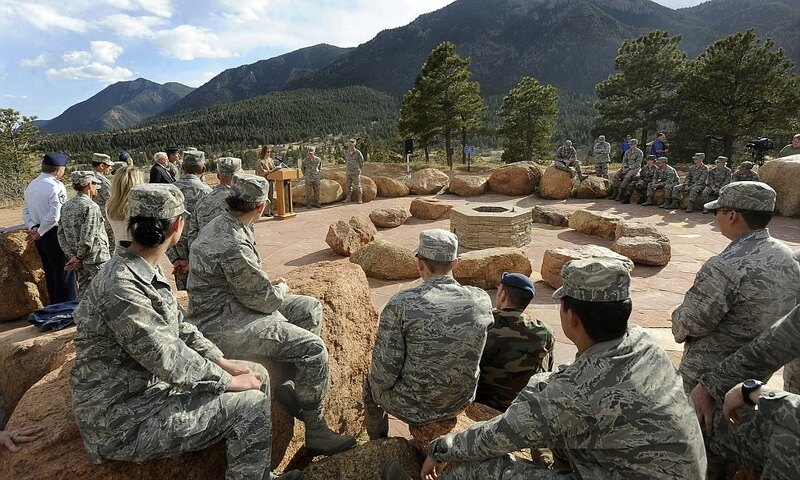 Their article began with this: "While there may be no atheists in foxholes, the Air Force Academy has decided there will be no mandatory God in the heavens." They noted, "The Academy---at 7,258 feet above sea level, the closest of all the nation's military schools to God's realm---has long had a reputation as the most Christian of the nation's military learning institutions." "But," TIME said, "the Colorado Springs, Colo., academy has decided to make the 'so help me God' coda to its cadet oath optional"---with a long explanation of how recent (1984) God had been inserted into the narrative. The oath had, until then, read: "We will not lie, steal or cheat, nor tolerate among us anyone who does. Furthermore, I resolve to do my duty and to live honorably, so help me God." TIME says the additional sentence had been "tacked on to add more seriousness to the oath" following a cheating scandal, according to the Academy. It's not exactly accurate to say the Academy has been the "most Christian"---especially in recent years. In fact, Tony Perkins, head of Family Research Council, has been keeping a list of the assaults on religious liberty in the US military, including the Air Force Academy. Last summer he wrote an article titled, "A Clear and Present Danger: The Threat to Religious Liberty in the Military." In it, he said, "The threat is wide spread but has become extremely acute in the US Air Force." The watch dog group Judicial Watch (JW), has obtained documents via a Freedom of Information Act request that reveal the Air Force Academy has been using donations and tithes given in chapel services to pay for cadets to participate in services and festivals that celebrate a wide variety of occult, satanic, New Age and other religious activities. Among other concerns revealed in the documents, JW discovered that although Christian expression is strongly suppressed at the Academy, and sharing one's Christian faith with a fellow cadet is punished under the ban on proselytizing, a group called "Spiritual Programs in Religious Education" hosts events at the Air Force Academy Cadet Chapel Falcon Circle on the Academy campus. The Academy website describes Falcon Circle as "The worship area [for]...an umbrella of traditions that includes Wicca, Paganism and Druidism." The documents received by JW also include records of "Living Earth" services, described as festivals, in which the Academy paid for presenters or speakers, using funds given at the chapel services. In fact, the Academy paid for 2 cadets to attend the May 10-11, 2014 "Earth Centered Beltania" festival. According to the Living Earth web site, this event is "a retreat and festival for all who follow Earth-honoring religion or spiritual path." Chapel tithes and donations paid for the 2 day religious retreat. The Judicial study shows this is a consistent pattern, including underwriting expenses for cadets to attend the "23rd Annual Denver Witch's Ball" and other similar events. JW says, "Despite the group's claim that Earth Centered Services 'does not proselytize,' the material from the Academy FOIA office included a 'promotional brochure' from the Spiritual Programs in Religious Education group with which the group leader acknowledged he works." There are not large amounts of money involved in all this---hundreds, maybe a few thousand dollars, but that's not the point. Tom Fitton, President of Judicial Watch, says, "The Air Force Academy leadership is attacking traditional Christian beliefs but will fund witchcraft and 'faery magick'---These records show the misplaced priorities in the Air Force and why traditional Christians increasingly feel unwelcome in the Air Force Academy." It also reflects why Americans are increasingly fed up with political correctness, inclusion, diversity, and all the other attempts to remove God and transform America into what it was never intended to be---a second rate, non-exceptional nation. After making their case that editing God out of the cadet oath was not as big a deal as it appeared, TIME said, "Opinions were mixed among posters [regarding the decision] over at the independent Air Force Times newspaper." They noted Eric Tyler posted, "Pledging to some mythological being is so 2,000 years ago." But Air Force personnel Paul Hartnagel said-- not so fast. "I guarantee that when they flame out and start going to ground at mach 1, they WILL be calling on God." America is "flaming out"---its time to call on God. I look at that list and I realize that such things were not what the founders had in mind when they talked about religious freedom.